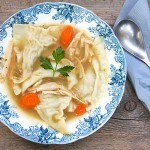 Turkey Kreplach Soup: here's what to do with leftover turkey! 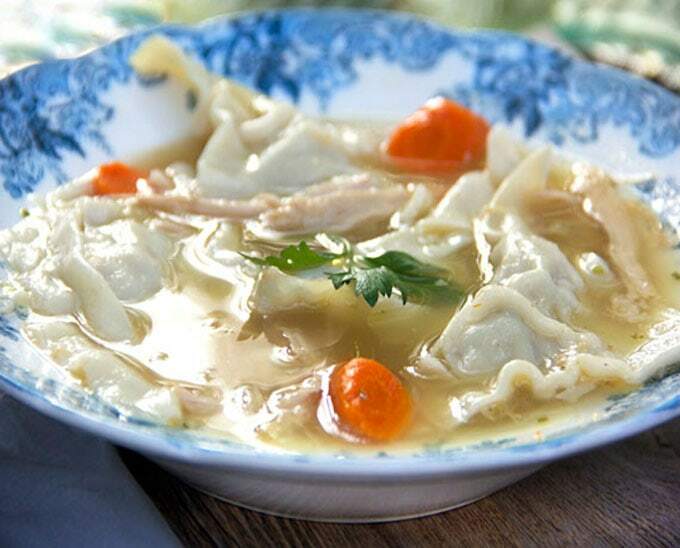 Turkey Kreplach Soup: here’s one of the best things to do with leftover turkey. 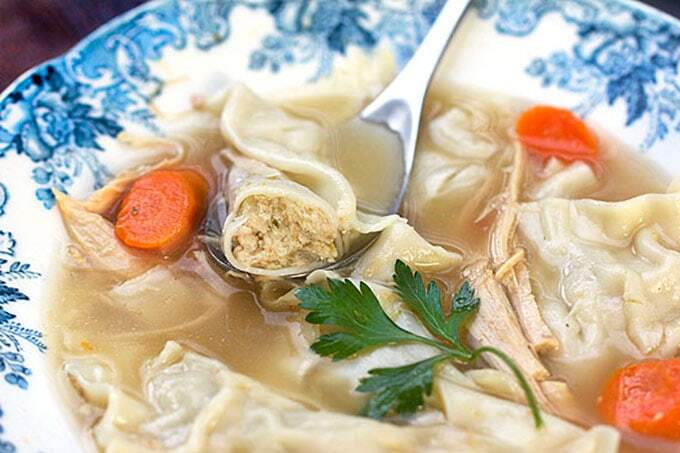 Make turkey soup with turkey dumplings. It’s easier than you think! Leftovers. Sometimes they seem like ‘yesterday’s same old same old.’ Sometimes they inspire. I think Thanksgiving leftovers inspire! Leftover turkey, for example, has so much potential to be transformed into something new and even more exciting than its original incarnation. I could list so many ideas, but I have something even better than ideas: at the end of this post – after the recipe for turkey kreplach soup and a bonus recipe for quick potato knishes, you’ll find links to 45 other fabulous Thanksgiving leftovers recipes – brought to you by the talented food bloggers of the Sunday Supper Movement. I think you’ll be covered for all of your Thanksgiving leftovers recipe needs! It’s so easy to make a scrumptious comforting turkey soup with whatever is left of your Thanksgiving turkey. You basically just throw the carcass into a large soup pot. (you may have to break it apart to fit it in). Add some vegetables – a cut up onion, a few chunked carrots and celery spears – some parsley and/or dill. Fill the pot with water and get it boiling. Cook it for a few hours at a gentle simmer. 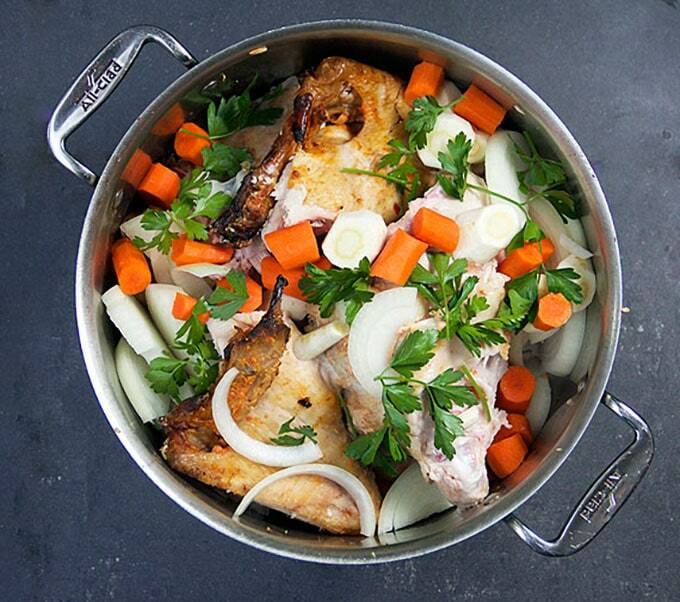 The broth will get rich and flavorful and will fill your house with delicious aromas. 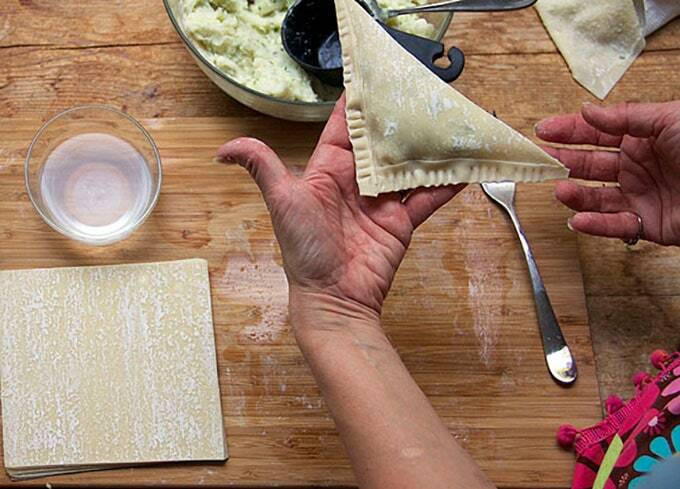 While the soup is simmering away, take your leftover turkey meat out of the fridge and make kreplach! Be sure to have a pack of wonton wrappers on hand and you’ll be all set! Kreplach is a Yiddish word. 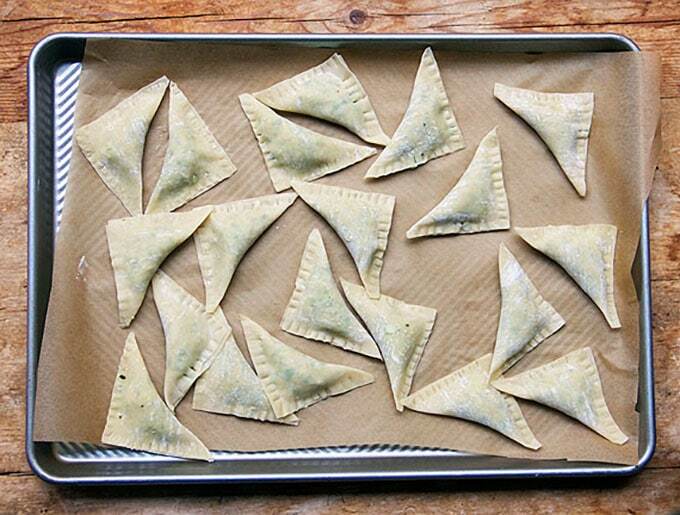 A kreplach is a dumpling. It can be filled with chicken, turkey, mashed potatoes, or anything else that inspires you. It’s usually served in soup but can also be fried. My husband and I both have Russian Jewish grandmothers who made us delicious comforting kreplach soup when we were kids. Their kreplach floated in chicken soup and were filled with the soup greens and chicken left over from making the soup. 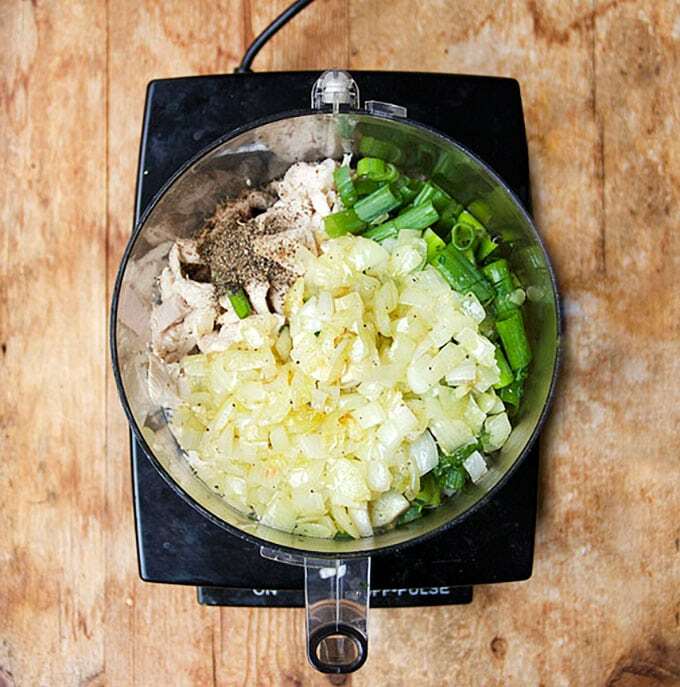 My updated version combines leftover turkey meat with sautéed onions, scallions, parsley and spices. Everything is ground up in the food processor, enfolded in little wonton wrappers, and simmered until hot and tender. 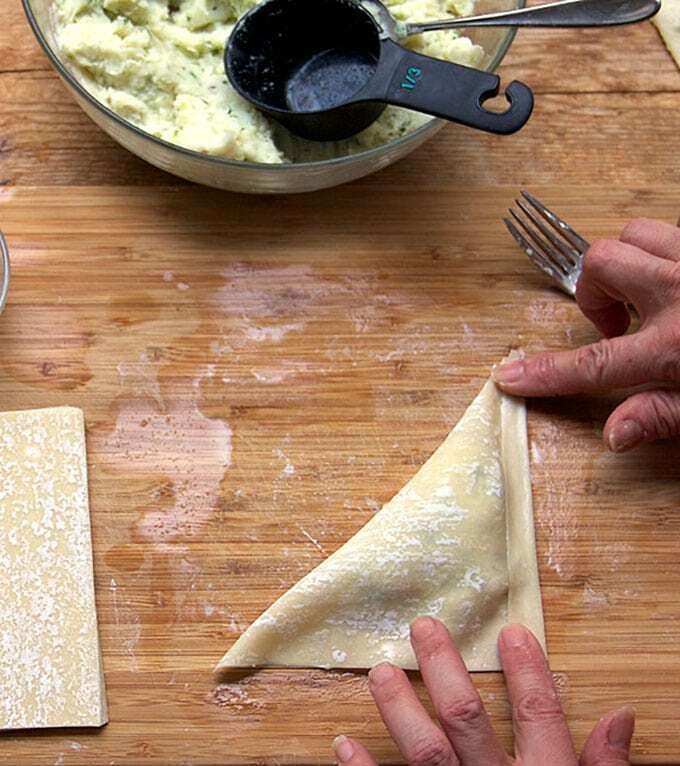 Set up a kreplach making station: you’ll need your turkey mixture, a cutting board or other clean work surface, a small bowl of water for moistening the edges of the wonton wrapper, and a parchment lined tray for for holding the kreplach as you make them. 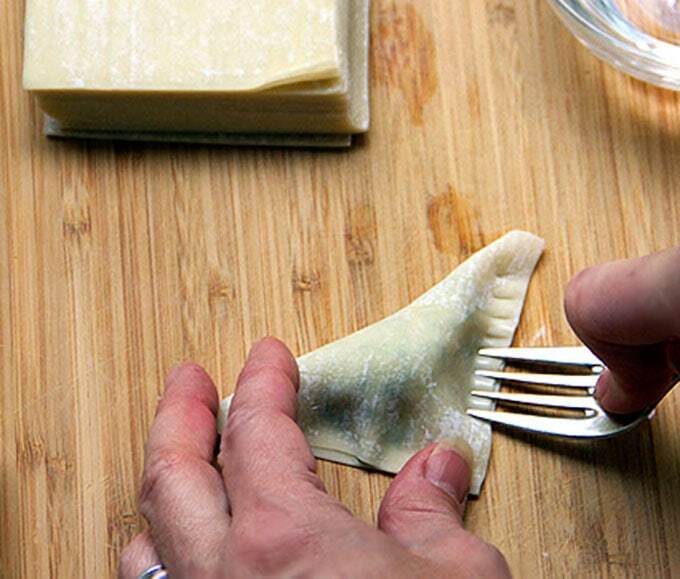 Use the tines of a fork to seal the seams. Then all you have to do is cook them in boiling water or soup. They’re tender and ready in five minutes! 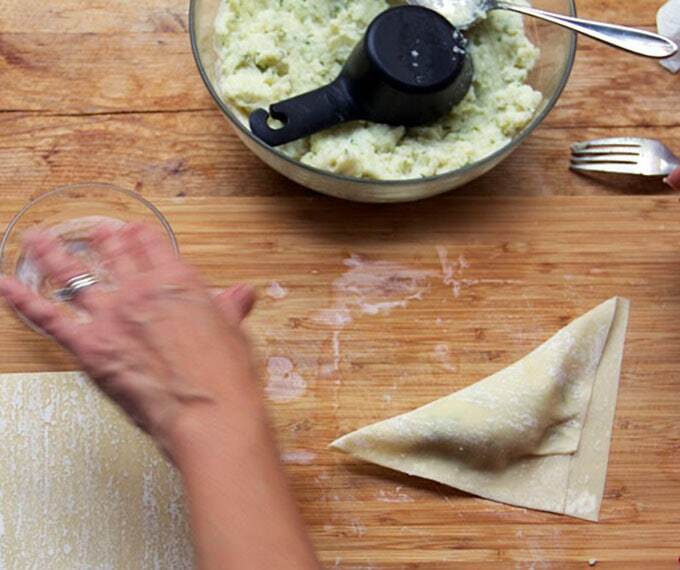 As long as you’re in the mode of wrapping leftovers, why not wrap some mashed potatoes?! You’ll need larger wrappers – egg roll wrappers. For these giant kreplach that I’m calling “quick knishes” I used leftover mashed potatoes combined with the same turkey mixture I made for the soup kreplach. Knishes are a delicious indulgence! Dip them in mustard or sour cream or even ketchup, if that’s your thing! Moisten that edge, fold it over, and press down. Make the same fold on the other side. Then seal the edges with the tines of a fork and they’re ready to be cooked. I tried pan frying them and I also made a batch in the oven. Both were delicious but the fried ones were the favorites of the recipe testers (my friend Donna and me.) 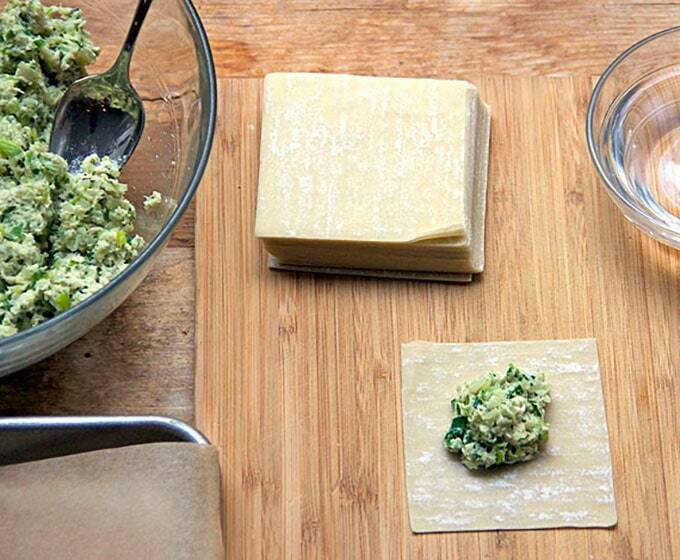 PS: if you’re a fan of knishes, check out this mini spinach potato knish appetizer recipe. Leftovers can be so much more than just something you have to use up so it doesn’t go to waste. They are an exciting opportunity. I also have to admit that sometimes – without any reinvention – I enjoy eating a dish even more the next day than I did the first time. It’s especially nice to wake up the morning after a cooking extravaganza like Thanksgiving… in a peaceful house… with a fully packed refrigerator. The cook has had time to rest. The flavors have had the night to meld. It’s then great to reconnect with and enjoy all the delicious foods that you worked so hard to cook. 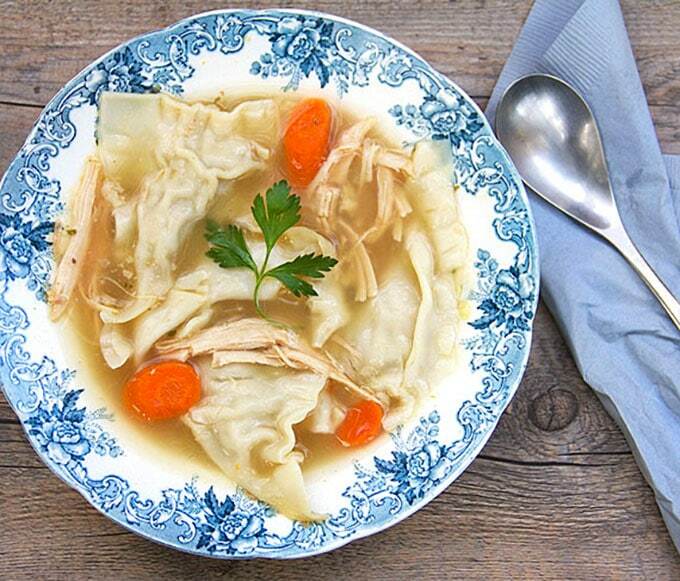 Turn your Thanksgiving leftovers into a delectable turkey soup with turkey stuffed dumplings called kreplach. 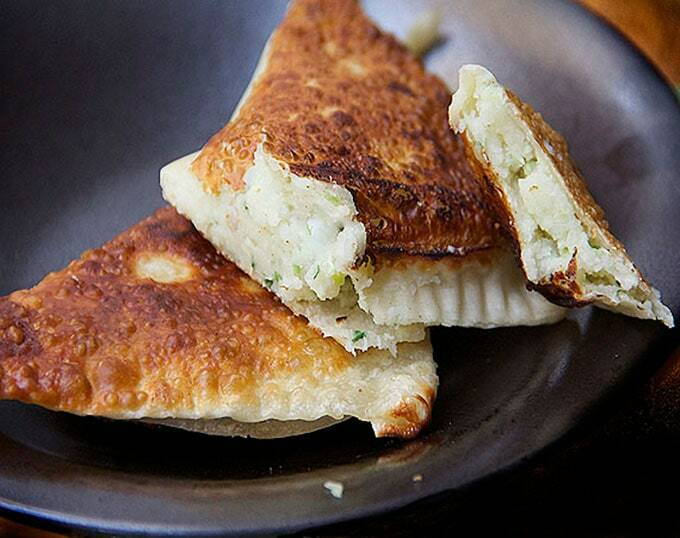 Also, wrap up leftover mashed potatoes in egg roll wrappers for quick and delicious knishes. Make the Turkey Soup Put the turkey carcass in a large soup pot. (You may have to break it apart to get it to fit.). Add the onion, thickly sliced carrots, celery, fresh herb(s), bay leaf, peppercorns and 1 teaspoon salt. Fill pot with enough cold water to cover all the ingredients by an inch or so. Bring to a boil. Reduce heat to a simmer, and cook for about 2 1/2 hours, uncovered, until the broth is rich and flavorful. Pull out the bones with tongs. Pour the soup through a mesh strainer into a large bowl and then back into the soup pot. Wait a few minutes for the fat to rise to the surface and skim off excess fat with a spoon. At this point you can add a couple of thinly sliced carrots and shredded turkey meat. Simmer them in the soup for about 5 minutes, until the carrots are crisp-tender. Season the soup, to taste, with salt and pepper. To Make the Kreplach Line a large tray with parchment paper. Heat oil in a small skillet over medium heat. Add the onion and cook, stirring occasional, until soft (don’t let it brown), about 7 minutes. Set aside. To Make the Knishes In a large bowl stir to combine the mashed potatoes with the turkey mixture. Set out a parchment lined tray, a small bowl of water, and the egg roll wrappers. Place a wrapper on your work surface. Add a scant 1/3 cup of the potato mixture. Moisten the edges of the wrapper with water. Fold, seal and crimp. (as explained in the photos above). Repeat until you’ve used up all the potatoes. You should have 15-16 knishes. To Pan Fry the Knishes Pour oil in a large frying pan so it comes up to about 1/8 inch. Heat the oil over medium heat until hot, but not smoking. Cook three or four knishes at a time for 3-4 minutes per side, until golden brown and heated through, adding more oil when needed. You can keep them warm on a tray in a 200F oven. Serve with sour cream, mustard or ketchup. To Bake the Knishes Preheat the oven to 375F. 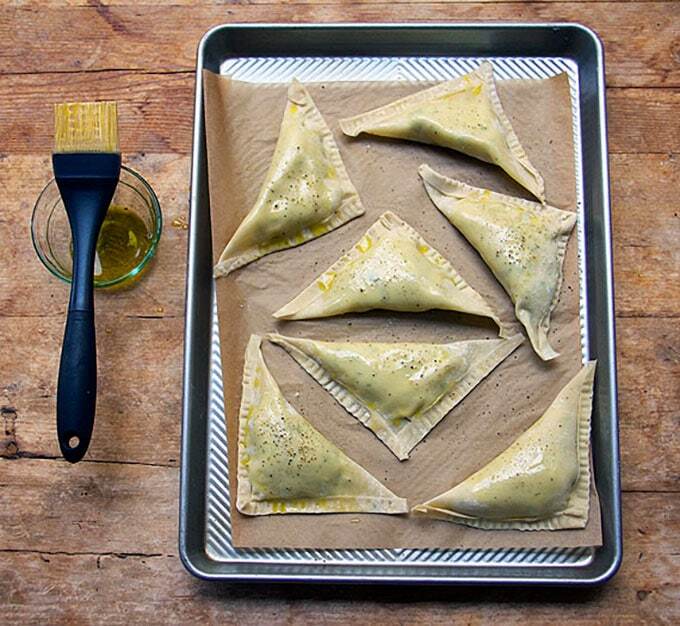 Place the knishes on two parchment-lined baking trays. Brush them with oil on both sides. Sprinkle them with a little salt and pepper. Bake them for 25-30 minutes or until they’re gold brown and heated through. Just made this for the first time. Had already made the base with a chicken carcass and was going to make a greek chicken soup. But saw this on the blog while looking for something else. Zipped down to the store to get wonton wrappers and was good to go. Turns out my husband had this as a child made by his grandmother. He was so excited when he saw I was making this I think I saw a little tear. Made way too many so froze about a dozen for another day! Wow, I’m so impressed that you took this on. It’s definitely a labor of love to make these. So sweet that you touched a tender spot in your husband. Food can do that. And so great that you have a stash in the freezer to look forward too. Yum!!! And I learned about kreplach, which I never knew before, so thank you! What a great idea! I bought a heritage bird this year and it’s a bit small – I don’t think I’ll have any leftovers. Will think about giving this a try with some chicken. I have never heard of these. But you can bet I’m DEFINITELY making these! They look DELISH! 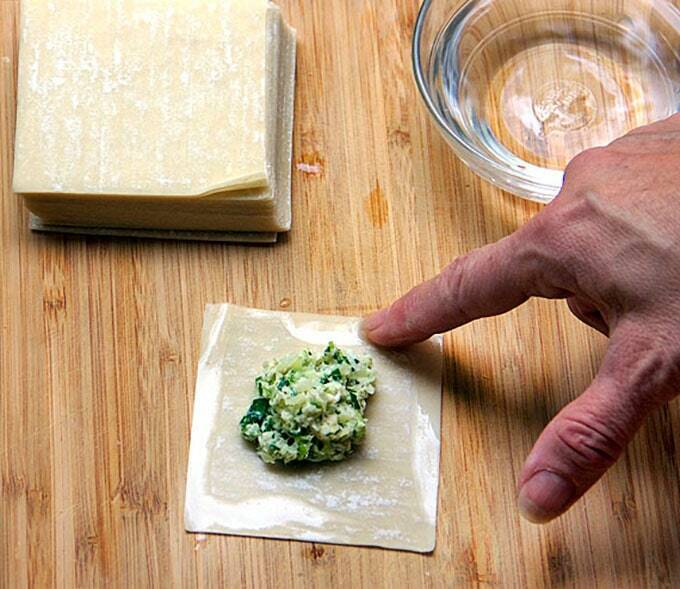 I love the idea of stuffed dumplings! Delicious! Genius! I love both recipes and lovely photos! Now you have me re-thinking what to do with my leftovers this week! Have a great Thanksgiving Lisa! I am making this on Friday! and looking forward to eating it and remembering my own russian jewish grandmas….. I am sure this will become a winter regular in our home. Have a wonderful Thanksgiving Lisa! Thank you for all your delicious recipes!! I would love a bowl of this soup for dinner! I love these dumplings, such a great way to serve up the leftovers!! Your kreplachs are now on my must make list!! YUM!! This is wonderful! I already want Thanksgiving to be over so I can make it! Thank you for such an amazing idea! I get super excited when I see that my Sunday Supper friends are fellow tribe members! I don’t cook enough Jewish food, so I love seeing others do so. I have Russian Jewish heritage too, I should make some kreplach! What a terrific soup. That sure doesn’t look like leftovers to me! TWO scrumptious ideas for leftovers!!! I’d love to sample both!!! Any way you cook those kreplach I want them!! They look amazing. Saving this recipe!! Oh, that takes leftovers to a new level – Lisa. Will store it away for after Xmas. That is one yummy looking soup – doesn’t even look like it was made using Thanksgiving leftovers! Oh. My. Heavens. I just want to take a swim in that soup. It looks amazing! 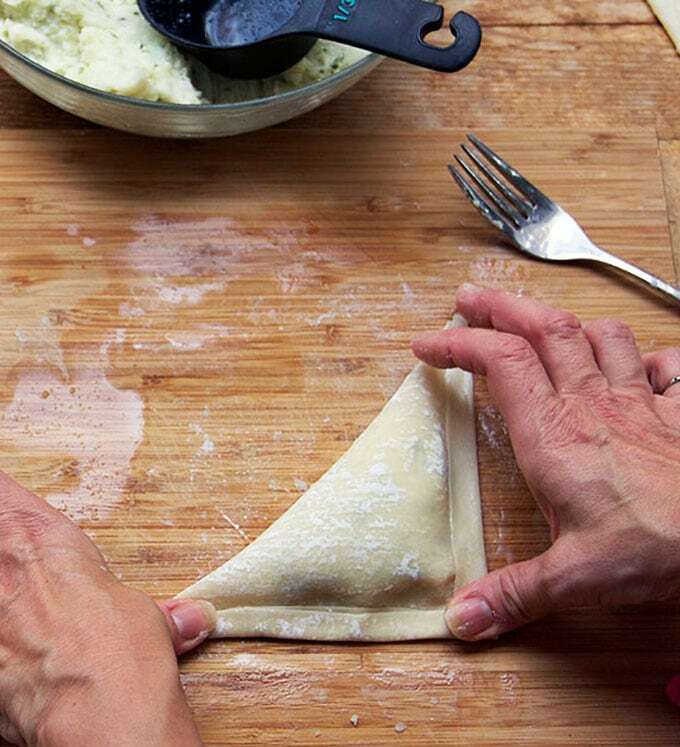 I love that you used wonton and egg roll wrappers to make your dumplings and knishes! That really takes the burden off of the cook and makes them do-able. What a great soup! And those knishes are a wonderful bonus. Stunning. Absolutely stunning. This soup looks delicious. Pinned.